How I love the Fall. Things get so busy! Between orders coming in like wildfire, patterns selling like hot cakes, family visits and parties to go to there is just not enough time in the day! I love the colder weather, even though I am a cold person by nature, I HATE being hot! Summer in Virginia tends to be long and relentless so every Fall it is the sweet relief I need to recharge my batteries. We had a ton of rain this year during the Spring and Summer so there really aren’t the traditional fall colors springing up everywhere like usual. It was just too wet. Everything is going from green to brown fast! But despite the lack of colorful awesomeness that is usual I have been enjoying the cooler weather. And with that cooler weather comes the yarn crafting bug. I have been crocheting and knitting up a storm! Working on a baby blanket for my new little one due in February, I’ve made several hats for her and hope to make a few more too :). One thing that has been a big part of my Fall has been Pinterest. I’m slightly addicted obsessed with Pinterest. There are so many good ideas out there, from decorations to crochet and knitting patterns to recipes. There is never a lack for new things coming up and I often find myself eating lunch or breakfast and browsing Pins. If you’d like to follow my boards click the button on the side bar. If you don’t/haven’t visited Pinterest, I highly suggest it. Much fun and inspiration can be found there. 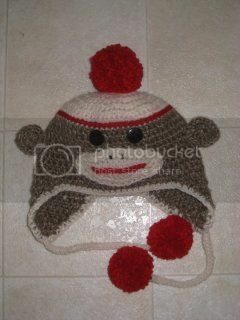 This entry was posted in hot, inspiration, knitting, rain, summer, weather on October 26, 2011 by littlebirddesignsfxbg. Today is my husbands birthday. Every year I make him a spice cake of some form or variety, as per his wishes. This year though I did not ask him what he wanted. I just made him something I knew he would love, Pumpkin Chocolate Chip bread. Now I must preface this with I did ask him if he wanted bread or muffins to which he responded, bread! I found the recipe here and being the chocolate and pumpkin freak he is I immediately knew he would love it. Super simple to make; just measure, mix, and bake. The end result was delish! I probably would have preferred it with fewer chocolate chips and more pumpkin and spices but overall he is thrilled so I am too! 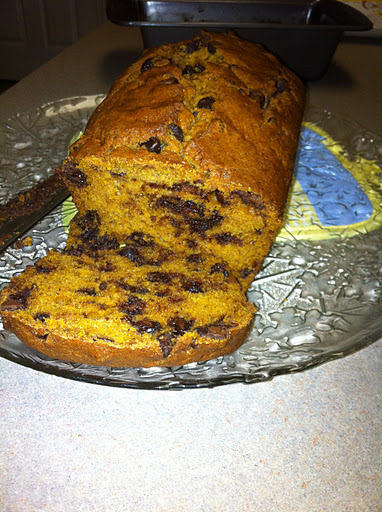 This entry was posted in husband, muffins, pumpkin, snack, yummy on October 8, 2011 by littlebirddesignsfxbg. Hello everyone! Hope this little message finds you happy, healthy, and in good spirits! I have had a few orders recently and been working to get them done, but in that time I have also been knitting! I am suddenly quite taken with it. I guess it is because back in the spring I taught myself how to knit Continental style and since then things have just seemed to click! Knitting is so much easier and faster when you have good tension and less movement! I started knitting my soon to be baby daughter a checkerboard blanket in pink and purple, and also made my first hat. Its a little big for a newborn but will probably fit her perfectly next fall :). I started another hat and this one seems like it will fit a newborns noggin much better. Once I have the blanket and second hat finished I will post pictures of them. I found an awesome recipe today. Fall is sorta synonymous with apples and pumpkins in this house and the author of “Smashed Peas and Carrots” Blog was kind enough to share a recipe for apple strudel today! I love apple anything and this looks so yummy! Take a look here. If you have any super yummy pumpkin or apple recipes, please share in the comments below. I am always looking for a good treat for fall! 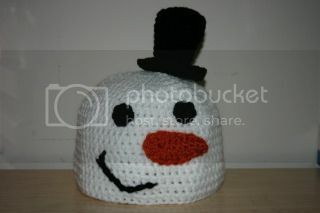 This entry was posted in hats, knitting, newborn, order, pumpkin, sewing on October 6, 2011 by littlebirddesignsfxbg.